Sometimes when one is used to looking at a situation from a particular angle, it becomes difficult to immediately realize there may be another angle involved, particularly when duplicitous intentions use a valid argument as cover. Last week I wrote a post commiserating with Naomi Chazan vis a vis police violence and general misuse and abuse of their power, particularly when silencing political dissent. Having witnessed and having been on the receiving end of such official abuse of power (along with Jameel and Lurker) to do just that on more than one occasion, the complaint was quite credible. It was natural that I, an advocate of the democratic rule of law and equal and fair application of it towards all citizens should join in protest against measures that were once solely used against us on the political right. But now I feel like a dupe. Everyone knows about Bi’ilin. 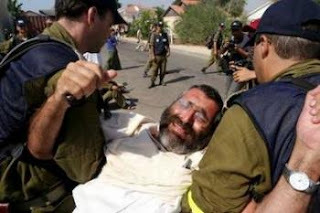 The violent Friday battles between the police/IDF and the various united groups of Leftists, Communists, Anti-Zionists, Arabs and others who unite to deny the Jew the right to Eretz Yisrael (much less recognize our right to buy or own land) . To some it seems it simply become a violent Friday ritual to pass the time. And if it were a stand-alone event, I would perhaps agree. But what we are witnessing in Bi’ilin is organized. You can see that it’s organized because the model is being duplicated in other locations. We’ve been seeing it in Hebron, where Leftists try to incite the Arabs on Fridays against the locals, but there the army has a tight grip so it has been less successful. It’s been going on for weeks now near Neve Tzuf, where the Leftists and Arab have been escalating the protests and violence against the police/IDF. And now it’s come to Jerusalem. What we are seeing in Jerusalem, near Shimon Hatzadik, is following the same formula. Leftists leading Arabs, and the two escalating their protests. Eventually the violence begins (if it hasn't already), and it becomes a weekly ritual drawing more and more resources from the security forces. How long until this is occurring in 10 places, in 20 places, in 100 places instead of 4 or 5? How thin will the countries security resources be spread as this Intifada expands. But this Intifada is different. It’s more sophisticated. It smells of Leftists. This intifada is targeted. It’s targeted in location, in subject, in tactics. It’s led by Leftists, our own fifth column, who use the Arabs as pawns (they’re used to that by now). In this case I believe the security forces identified the pattern and realized what the Jerusalem protest is leading into. Have their actions nipped it in the bud? Absolutely not. But it at least appears they do know what they are up against, and that’s a start. I completely withdraw my sympathy to Chazan, and I apologize if my position last week led anyone else to mistakenly share that incorrect view. What we are dealing with here is nothing less than a new front in the war against the State of Israel. When I saw her headline in the weekend’s JPost magazine, “Silencing dissent, fortifying a movement” I was momentarily confused, and assumed she was surprisingly going to be speaking about something close to my heart. I assumed she would be speaking about the intimidations, and various human and civil rights violations that regularly take place against Settlers and those designated as being on the “Right”. I mean after all, just last week the JPost ran the story of a Jewish girl arrested on her wedding day for allegedly trying to pray on the Temple Mount. And all of last year the news was filled with the story of how the government kicked out the Jewish residents of the legally purchased Beit Hashalom in Hebron. Or how Noam Federman’s home for over a decade was destroyed overnight, and his children scattered to wander the streets in a state of shock by brutal soldiers and policemen. Or of police brutality against peaceful (and legal) right wing protesters (personally witnessed). And of the biggest human rights crime in Israel of the last decade, where 8000 Jews were expelled from their homes, their business destroyed, and after years, their situation still unresolved – all in the name and abuse of democracy. I might have thought she would speak about how Susie Dym was arrested for handing out flyers (produced in a joint project with the National Council of Young Israel and Near East Policy Research) before Bush’s last visit. This miniscule sampling of examples of “silencing dissent” in the State of Israel from the last few years managed to all somehow pass under Naomi Chazan’s radar. I mean, that fine. Naomi Chazan is about as far left as they come, and you can’t have any reasonable expectations that a leftist would demand respect for the freedom, human and civil rights of her fellow citizens whom she disagrees with. And I guess that’s were Naomi and I differ. Because after reading her article (I usually skip it because her whiny writing makes me nauseous) I sympathized with her. I know that as a member of the elite, what she experienced is a new and unexpected experience for her. And new experiences can be scary, and can shake your worldview. But more importantly, I sympathize with her because the State and particularly the Police do not respect the human or civil rights of citizens of the State – and this is a serious problem. A very serious problem. It is a problem that all us citizens face - together, and if we don’t stand up to demand this treatment ends against both ourselves and our fellow citizens, then in the end we each stand alone and will fail. As an aside, the fact that the Leftists who were protesting were demanding the total disregard of the legal rights of their fellow Jewish citizens is irrelevant (and typical for Leftists in Israel). But as long as their method of protest was within the legal bounds of the law, then they shouldn’t have been treated that way. No citizen of Israel should be treated that way - even us Settlers and those on the Right. Here's a bit of a surreal headline that appeared in today's Ha'aretz. The joke during the Oslo negotiations was that Peres was the lawyer for the Palestnian side. Peres continues to be confused. When I first saw MK (and Dr.) Michael Ben-Ari at an Ichud Leumi meeting, I thought that he was some Shas guy who walked into the wrong room. Certainly no one really knew much about him when he was placed on the list. It was when he sat down on the dais and began to speak, did I realize that I was sitting in the room with someone who I thought was going to be one of the most important people in the Knesset. And I haven't been disappointed - he is probably the biggest surprise this Knesset has to offer. Bibi relegated the Ichud Leumi to the back benches of the Knesset, but despite being thrown into the political desert, Ben-Ari has managed to thrive and prove what a quality politician, leader and individual he is. I don't always agree with everything he has to say (most yes,but not everything), but I am proud that I constantly see him on the forefront fearlessly fighting our battles in the Knesset and in the field, and saying what needs to be said - unabashedly and intelligently. MK Michael Ben-Ari is definitely the politician to be watching over the next few years (at least until he gets banned from the Knesset for being too popular). He has certainly managed to annoy the establishment. Two advanced technology deals are in the news today. The first is that Israel will be selling advanced drones to Turkey so Turkey can use them for surveillance on "Turkish rebels". The second is a hi-tech company in Ramat Gan called DaroNet which sold a million dollar CMS system to Iran, claiming they didn't initially know it was for Iran until the European intermediary asked for a Farsi translation. Both these events are disturbing. 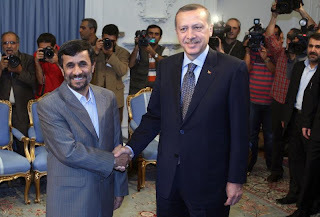 Turkey is openly siding with Iran. They are strategically realigning themselves with our enemies - and we are providing them with advanced military technology. As the DaroNet case clearly proves, Iran has no problem working to acquire advanced technology through third party intermediaries. There is no reason to assume that this Israeli military technology won't be in Iranian hands in a matter of months. Secondly, with Turkey's realignment with the enemy, it would seem to me that the Turkish Rebels (probably the Kurds) are a people we need to begin investing in for the long term, not hurting militarily. Ehud Barak made a disturbing statement, "We will continue to be strategic allies as long as our interests force us to do so." Yes, this is true in politics, except the foreshadowing his statement makes indicates he has an idea how long that will be for. Out interests force us to currently be allies with Turkey, but Barak is openly hinting that our interests won't be aligned for much longer. Barak apparently feels that by buying off Turkey with weapons we can somewhat delay Turkey's break with the West. A good idea in the short term, but a very dangerous game in the long term. Meanwhile DaroNet may or may not find themselves paid, and may or may not find themselves under investigation for illegally selling to Iran. And it certainly makes you wonder what other US and Israeli technologies Iran has acquired through third parties and placed into their military programs. It doesn't amaze me how many politicians and talking heads are attacking Danny Ayalon, compared to how many should be speaking out against the public humiliations and attacks committed by the Turkish government against Israel - notably against President Shimon Peres who was humiliated on TV by the Turkish Prime Minister. Could Ayalon had implemented it better, yes, but there is no getting around that the message needed to be sent. There are those that are saying that we shouldn't be pushing Turkey away and into the arms of Iran and Syria. They are wrong. Wake up people. Turkey is going the way of Iran and Syria, and now is the time for decisions and tough love. Dancing tippy-toes on fragile eggs is not going to fix this problem. Turkey simply can't have it both ways, straddling the fence as a full partner to Terror States that want to destroy Israel (while spewing Antisemitism) while maintaining a strong relationship with Israel. Israel needs to make it clear that Turkey is playing a game that has consequences. Antisemitism is not acceptable from a country that wants a warm or cold relationship with us. You can't spit on Israel and expect us to turn the the other cheek. Rolling over and ignoring what's is spewing out of Ankara is not going to stop them from going over to the dark side - it will only make it worse for us. While on the other hand, forcing them to make a decision as to where they want to be and on which side of the fence, might be the only way to stop this train in its tracks. They story is always the same. Young Jewish girl goes partying. Jewish girl gets picked up by nice Arab boy. Girl falls in love. Girl gets married and moves to Arab village. Girl finds herself a prisoner unable to escape. 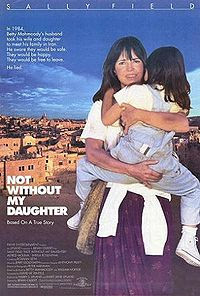 Unlike the movie 'Not without my daughter', in Israel captive women have some outside assistance in escaping with the help of an organization called Yad L'Achim. The JPost has the story of a woman named Oshrit Ochana (formerly of Ashdod) who just yesterday escaped from Gaza. Ochana and her four children - Mahmoud, seven; Abdel Rahman, five; Sali, six; and Asma, not yet two; managed to escape from under the watchful eyes of her Arab husband's family. Through the assistance of Yad L'Achim the authorities at Erez were ready to help her cross out of Gaza, and now will be helping her set up her new life of freedom. Unfortunately there are plenty of more Jewish women that fall prey to these Arab suitors and are held captive in Arab villages throughout the country with no way of escape. It as just a week or two ago when Foreign Minister gathered all the Israeli Ambassadors and told them their job will now actually include defending Israel. A new concept for some of them, but I can proudly say, not for all of them. If you're a regular reader, you'd know of Turkey's various attacks against Israel in the political and media arenas. You'd also know that Israeli voted with their feet and stopped visiting Turkey in response. But there hasn't been a serious government response - until now. Deputy Foreign Minister Danny Ayalon went out of his way to "humiliate" the Turkish ambassador to Israel. This was in response to the latest Turkish government's Antisemitism, incitement and attacks against Israel. It's about time and Kol Hakavod to Lieberman and Ayalon. In other news, an Iranian nuclear physicist was blown up in Iran outside of his home. An independent poll in Israel showed that Obama has a popularity level somewhere around 4% in Israel. I discussed J-Street polls in the past which are producing results that simply don't match what anyone else is polling, but more interesting do match the official J-Street position and helps promote their agenda. What's the point of such polls you might ask? Who foolish enough to believe them? Apparently the Obama administration does! CHARLIE ROSE: In terms of taking positions. Why is President Obama’s popularity so low in Israel? It’s four percent. GEORGE MITCHELL: No, that’s completely false. CHARLIE ROSE: Have you heard that before? GEORGE MITCHELL: I’ve heard the figure, and you’re citing a commonly cited public figure. CHARLIE ROSE: Exactly. So tell me why that’s wrong. GEORGE MITCHELL: Because it’s simply not true. Several polls that I’ve seen in the past month show that he is -- I’ll give you the numbers -- 49 percent favorable, 45 percent unfavorable, 43 percent favorable, 37 percent unfavorable. It’s a reasonable number. A plurality support him in Israel and a smaller plurality oppose him. Since it's only the J-Street (and J-Street board member) polls that supply numbers like that, it's clear who has the ear of the President, and who is conveniently feeding him biased research. And who wants to believe it. There are those among our nation's enemies that love to define Judaism as a late development. They claim the Temple never existed, King David had no Kingdom, and their favorite, that the Torah was not written when it was. But one of the amazing things about Israel is that the more the archaeologists dig, the more they disprove the above statements, leaving the Palestinians and Tel Aviv professors grasping at straws. Scholars at Haifa University uncovered some inscriptions that until now mystified everyone. The tablets they were found on were dated to the time of King David, and found in what was a small outlying village. It took them a while to realize that they were reading a proto-Hebrew document that was written 4 centuries before certain professors claim that Hebrew writing even existed. Furthermore the context of the text dealt with issues typically only mentioned in the Torah, and the language was sufficiently complex to indicate that Hebrew was certainly a complex and developed enough language to write the Torah. I don't expect the fanatical minimalist at TAU to revise their beliefs as a result of the facts, but for the rest of the world, you can certainly expect that as archaeology continues to find more amazing ancient finds in Israel, that more texts will be found that date Hebrew, the Torah, and the Jews to an even earlier age. In fact, science may eventually catch up with what the Jewish nation has known since Ma'amad Har Sinai. I recommend reading the Arutz-7 article which goes into this in more depth. Rumors are flying that the family of the Ayatollah Khakamenei are secretly slipping out of Iran and into Russia. If that's true, it's an excellent sign that the civilian revolt is make good headway. Can you imagine if Iran returned to its roots, rejected Islam, and became allies with Israel? I guess the Mossad plan to formulate an Iranian revolution through JPost twitters is working.